The starless night sky, a rich blue, shone through the tent, producing a bright green glow. I had underestimated the cold too, and shivered through the night, emerging the next morning wearing every article of clothing I had packed. Despite the rough first camp, it was worth it to marvel at where we were. 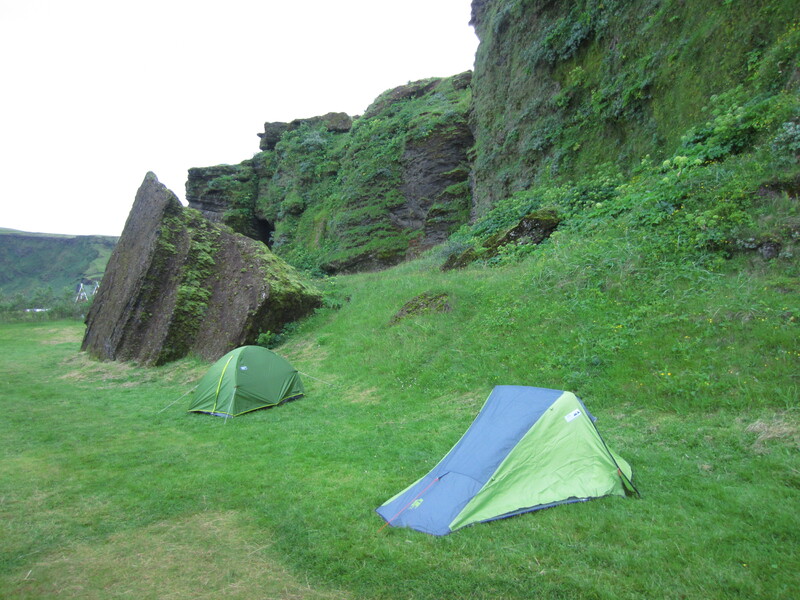 Our tents were dwarfed by a sheer cliff, a colossal boulder serving as a wind block. Families of gulls squawked and complained noisily high above on the rocks. 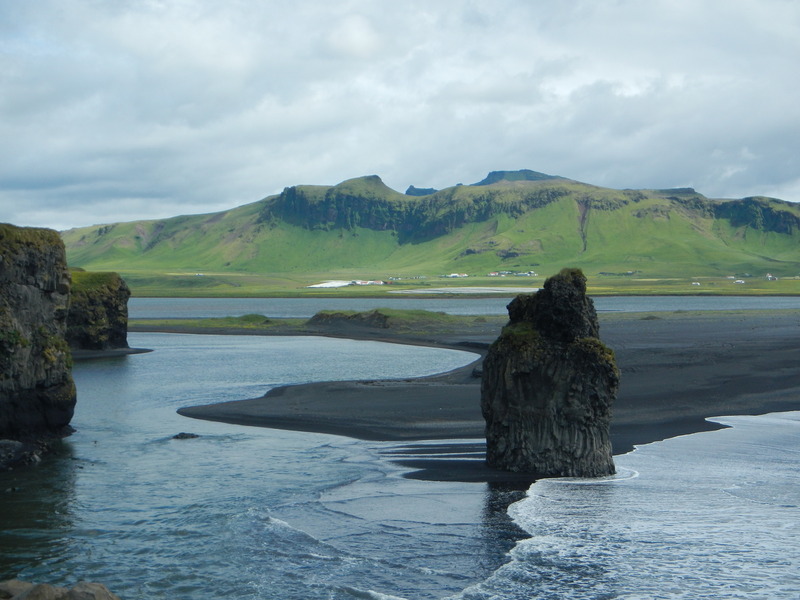 The town was one of the few in Iceland with an easily rememberable and pronounceable name; Vik, meaning ‘port’, at the southern tip of Iceland. 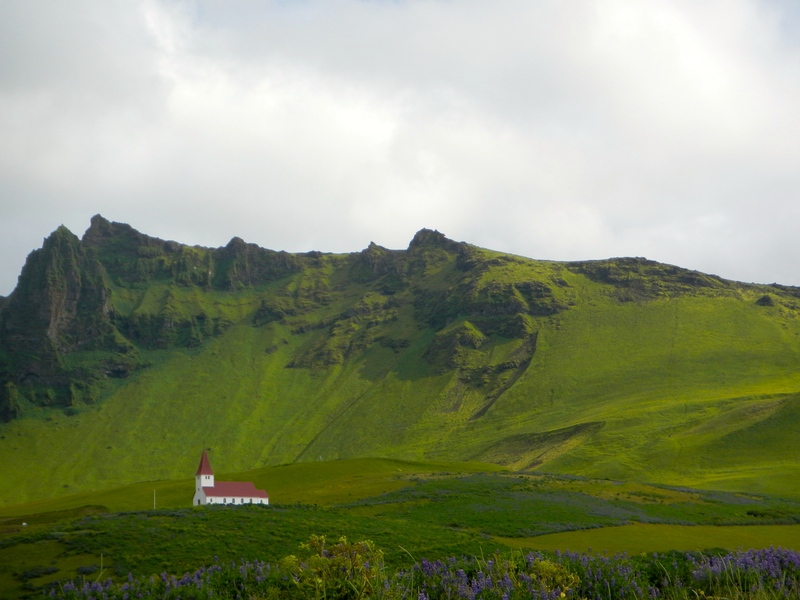 To the north, Vik is boxed in by the Mýrdalsjökull glacier, and the mountain passes draped over and around the Katla volcano. To the south, the blue grey waters of the Atlantic were alive with dive-bombing fish raids of masterful sea birds. Vik is small. Very small. From afar, it appears to just consist of several campsites and scattered houses. 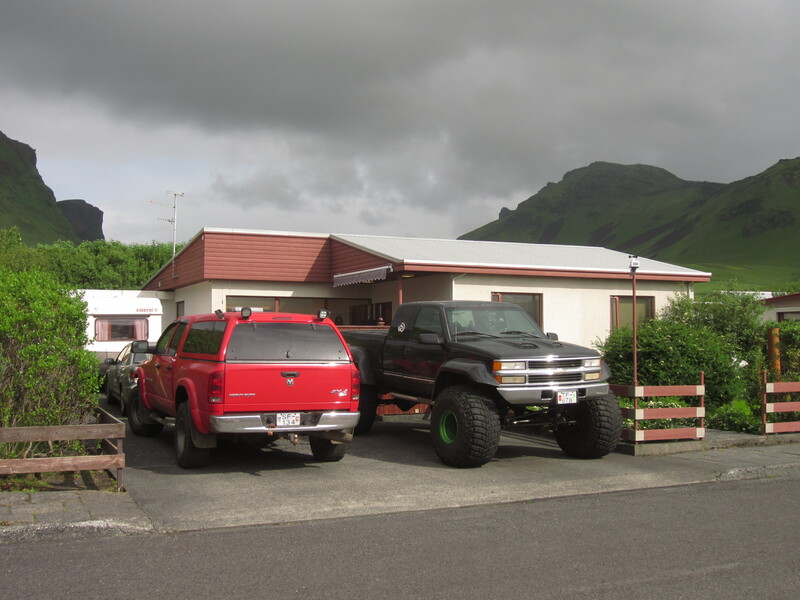 Some locals appeared to drive monster trucks here. From the beach, it appears to disappear completely. 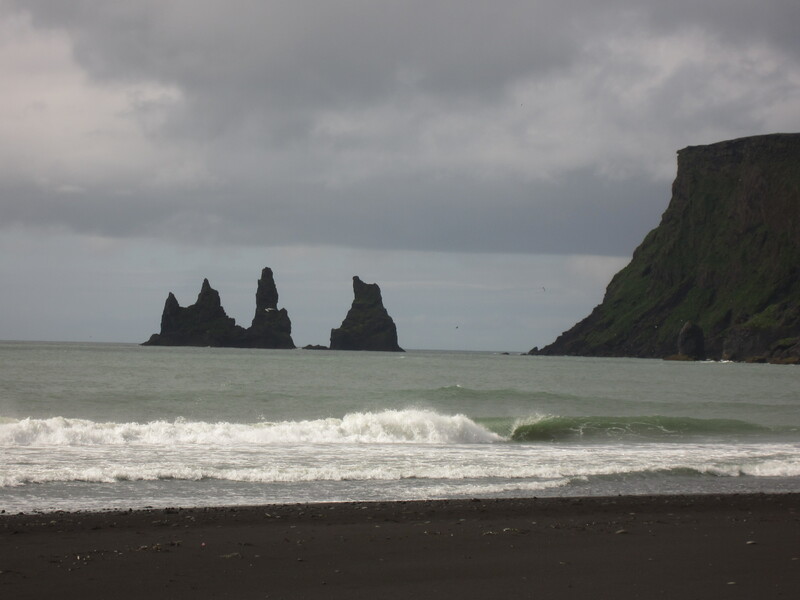 Past a towering statue of a naked, silver man on a high pedestal, Vik meets a beach of fine, jet-black sand. Further out to sea from the headland, jagged sea stacks lift out of the water, reminiscent, surely, of Poseidon’s trident. 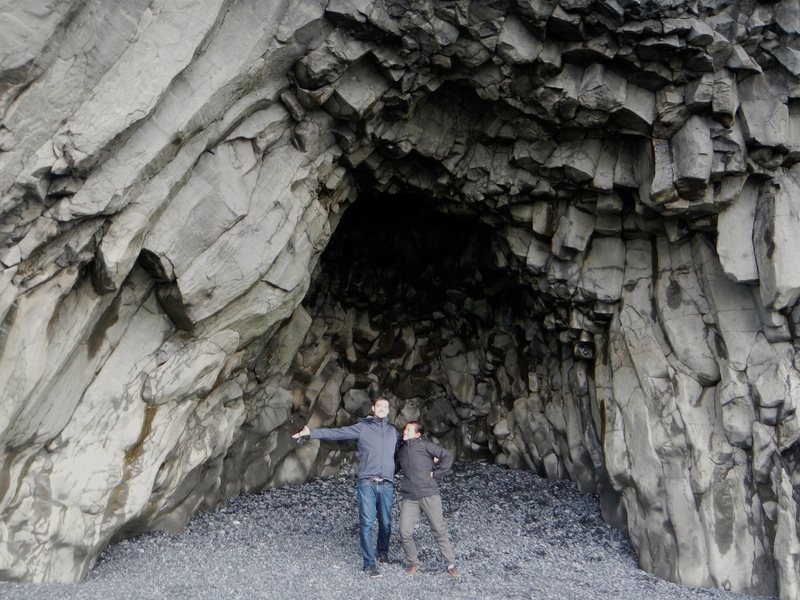 But from the other side of the headland, the rock formations become even more incredible. 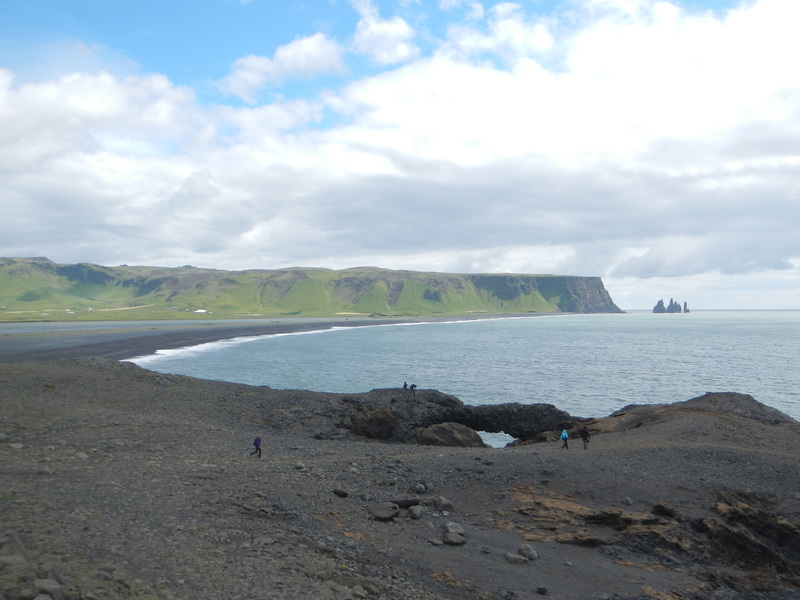 The beach at Vik is nice for photos, but nearby Dyrhólaey takes the cake. A sheer drop cliff face and long pebble beach chase each other around the shore, curling into the ocean as a blockish, arched peninsula. Out to sea, more stuttered columns of rock stand mightily in the waves. 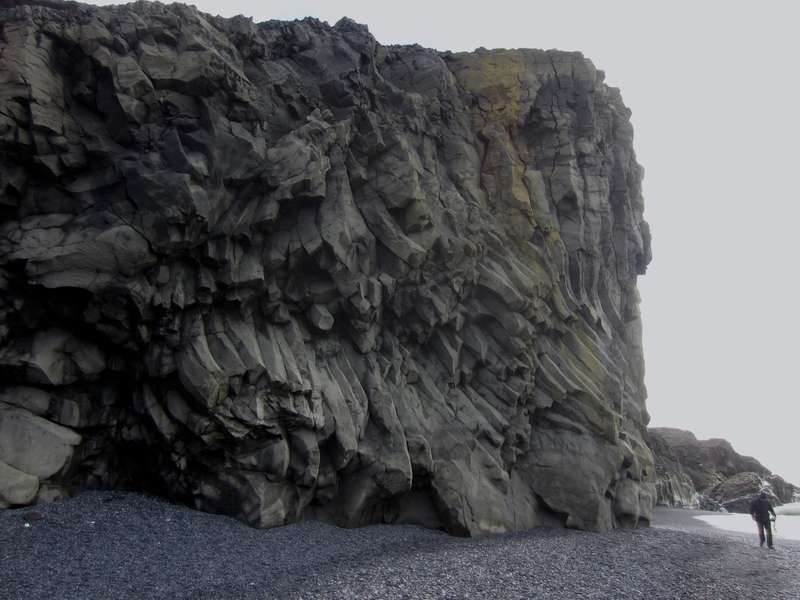 What’s really cool about Dyrhólaey are the clusters of basalt rock formations, bending and twisting over the ages, in unison, as if made from putty. Looking east, another rock form bends into a seemingly impossible natural bridge, whilst a grass-covered sea stack guards a sandy river inlet. 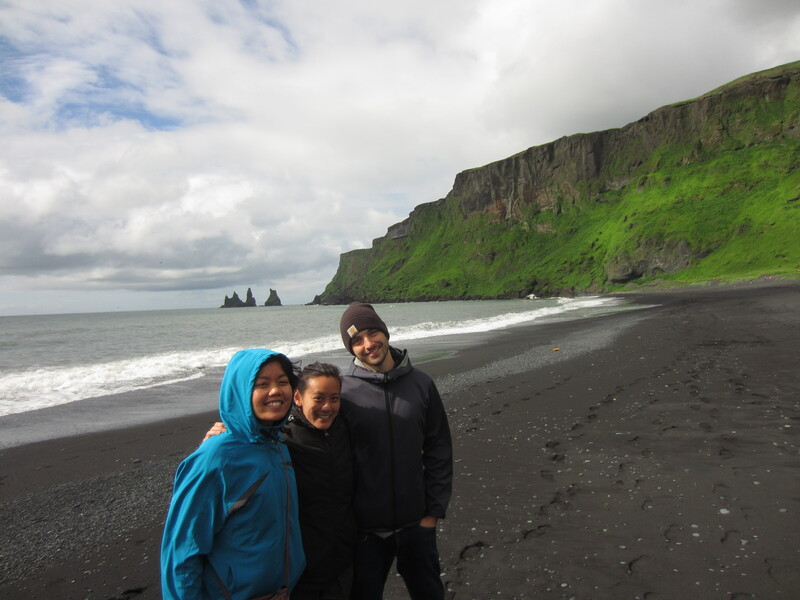 So far, the natural beauty of Iceland was just getting better and better, and we hadn’t even spent 2 full days on the road yet. We were getting closer to ice-white glaciers, pouring down from the mountains. We could see them, and I was excited as hell. But before I talk about the soon-to-be-visited world of ice and glaciers, there was one more treat waiting for us. 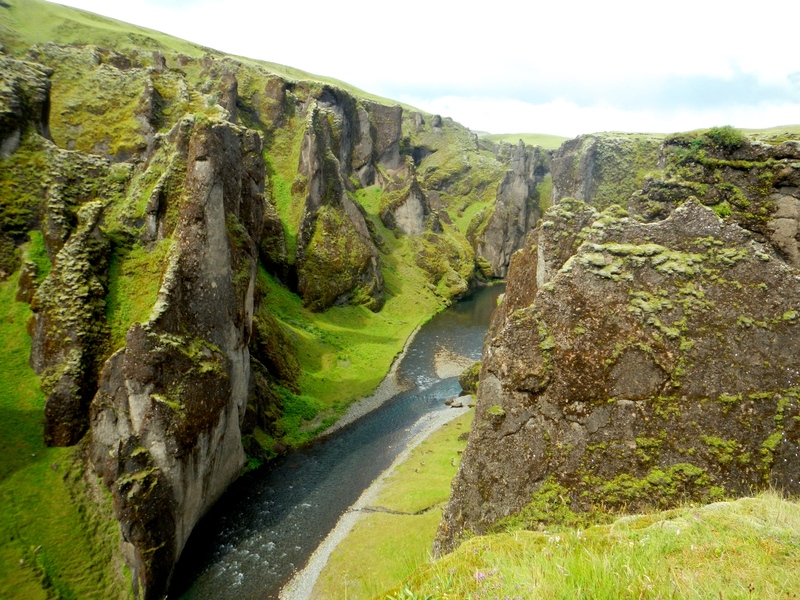 The sight, a canyon named Fjaðrárgljúfur, somewhere in Iceland’s south, had been researched by Cindy (and no, I didn’t even try and pronounce it). I’m glad she knew about it ahead of time, as it seems almost impossible to stumble across. The road sign appeared suddenly. We crunched down a long gravel road in-between the mossy boulder fields and meadows, driving down inclines that I was positive our sad little rental car couldn’t re-climb (it did). At road’s end was a small carpark at the mouth of the canyon. 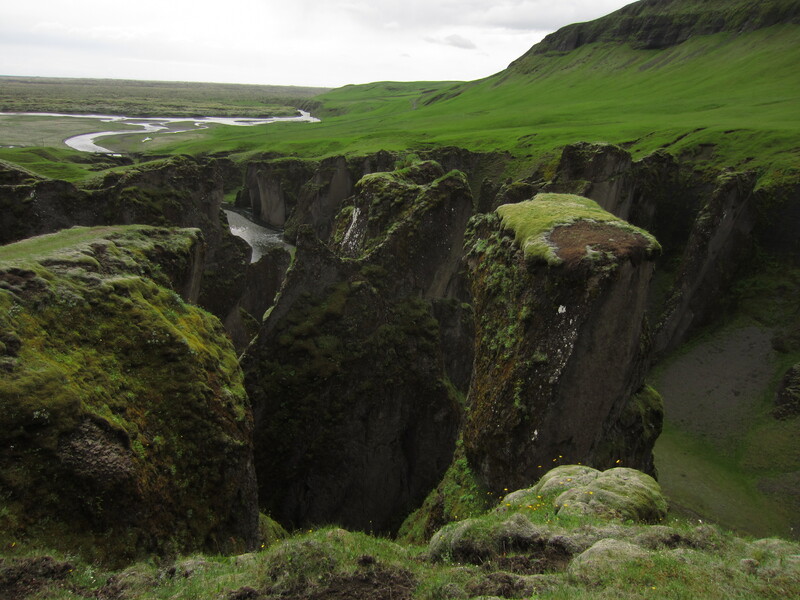 Easily climbed, the grassy hills around Fjaðrárgljúfur rose sharply, offering a hundred terrifying viewpoints. The palagonite walls of the canyon are not straight; they are smoothed off and eroded down, warped and precarious, like a mouth full of crooked teeth, shaping themselves into the tiniest (most vertigo-inducing) viewpoints. With the rolling hills behind, and the crumpled, moss-covered layered effect of the canyon, the spatial awareness made my head spin. 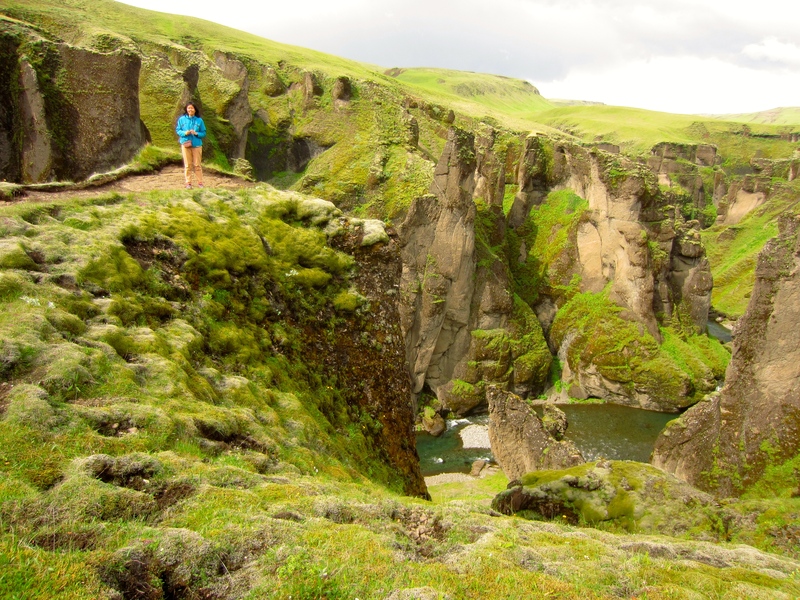 The paths allowing access to Fjaðrárgljúfur were nothing more than muddy shoe-made tracks through the grass. Occasionally a piece of string had been erected to protect us from the drop, or a helpful sign showing a stick figure plunging to his death. 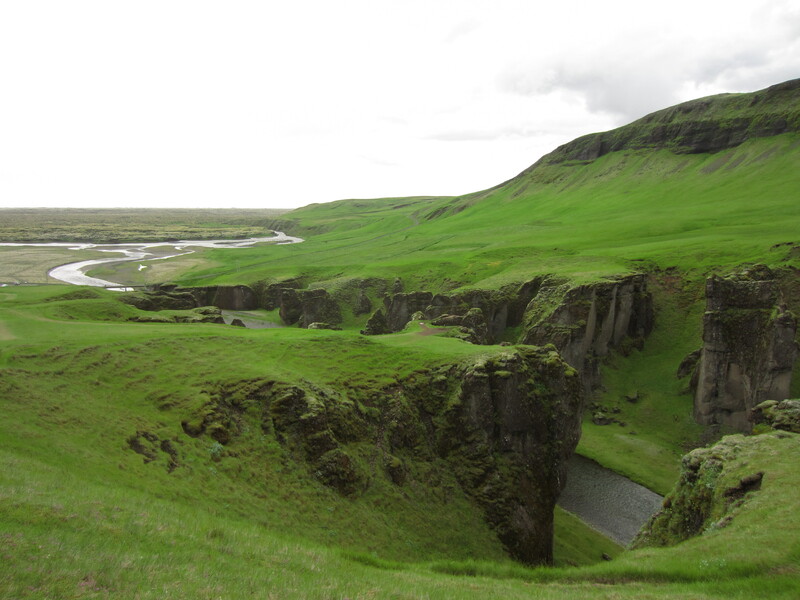 The Icelanders had done well to balance the preservation of the site with all the necessary warnings. And so it should stay. There were a few more people in the distance, but we felt like we had the place to ourselves. The turnoff is ‘blink-and-you’ll-miss-it’, and the big tour buses can’t handle the road, and that’s a good thing. Great article, that probably was my first slap in the face!!! The beach was really incredible! Yeah, I wish we could have seen the other beach nearby too!! Wow, that is some stunning scenery! That campsite looks incredible but you must have been freezing! How cold does it get there at night? I’m not sure exactly…not freezing…but I usually slept in a sleeping bag, with pants, jumper, jacket and beanie! Yeah, it was pretty amazing. Definately looks even more impressive in real life. 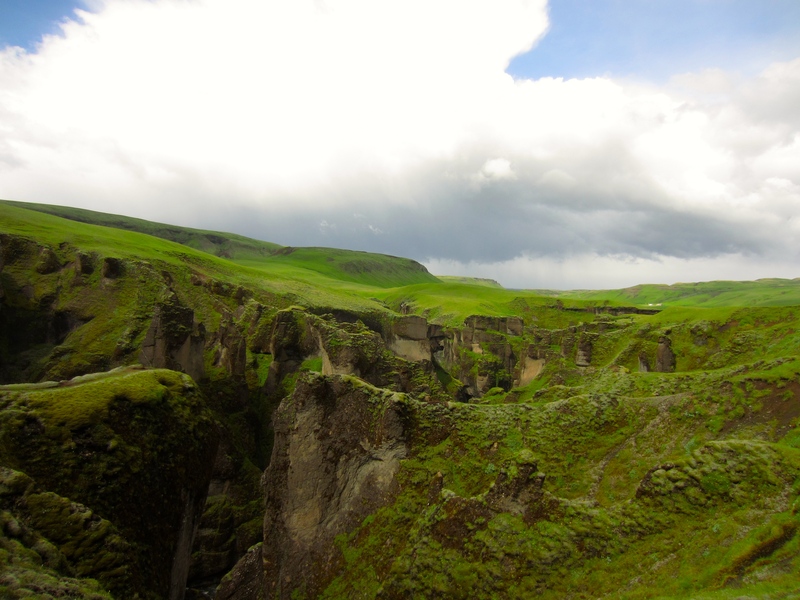 I totally recommend visiting Iceland at some point!